It seems the German people have become even more enamored by the speed and antics of our golden boy Usain Bolt-I didn’t think that could be possible. On Sunday August 23rd during the closing ceremony of the 12th IAAF World Track and Field Championships the track star was presented with an original segment of the Berlin Wall. The not so small token measures 3.6 meters (12 feet) high and weighs 2.7 metric tons. 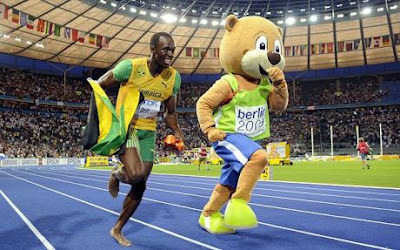 A special company will deliver the present to Bolt’s training camp in Jamaica. The monumental token was presented to Bolt by Klaus Wowereit the Governing Mayor of Berlin and president of the Organising Committee for the World Championships. The façade is decorated with a life-size painting of Bolt running on the blue track of the Olympic stadium and the words "NEW WR" _ new world record. Very appropriate for an athlete whose world records in the 100 at 9.58 seconds and 19.19 in the 200 meters shattering the apparent limits of human performance in this 20th year since the fall of an enormous barrier to human interaction. The wall, which once divided communist East Berlin from West Berlin between 1961 and 1989 was both a physical and symbolic representation of the Iron Curtain. The Berlin Wall was more than 140 kilometres (87 mi) long. In June 1962, a second, parallel fence some 100 metres (110 yd) farther into East German territory was built, it completely encircled West Berlin, separating it from East Germany, including East Berlin. Until 1989 it stood as arguabley the most visable and hated feautre of the cold war(1945–1991). 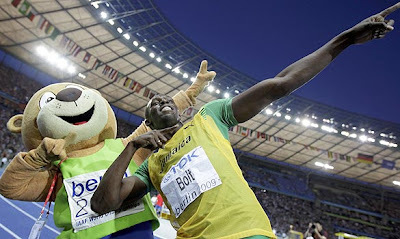 Bolt’s response to the gift was "I will never forget Berlin," he said at the ceremony. "Ich bin ein Berlino." No doubt the one of a kind gift bears much significance in both the career of our young athlete and the history of a very old county, forever bonding us in a shared moment. The only problem is this is the country that gave us Marlene Dietrich and a host of other beautiful and iconic images and people. Now why did they have to give such an ugly representation of a beautiful gift? 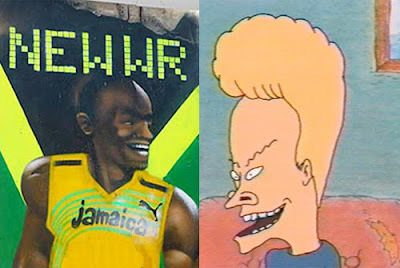 As a friend said maybe it was done by the people at MTV because it certainly looks more like Beavis than Bolt. Maybe it's just me but it just feels like a bad Christmas sweater from your Gran Gran or getting a suckie game for your birthday that bums you out. Don’t worry too much Berlin, we understand that it’s the thought that counts.